Has this problem been solved with previous versions? "I state that I don't have a new PC, it's about 10 years old. It's a laptop with 4 GB of RAM, 150 GB of hard drives and an Intel Core 2 processor. When the PC starts up, the CIS icon is displayed in some cases even after 5 minutes along with all the remaining CIS processes. Therefore, after not having problems of slow PC, the problem arises only when the PC is restarted or switched on. Please solve, I really like the CIS. The same problem also with CAV. Now in the meantime I'm using CCAV that doesn't come from these problems." I have reinstalled CIS and am testing it. For the moment it seems to be working fine and it is not causing me the problems of slowing down when starting up the PC and the icon lagging behind when starting the PC, which instead happened in previous versions. I will continue to use it and see how I find myself. In the meantime I suggest you improve the protection against phishing that in CIS is non-existent and also using COS is very very low. At least improve the protection against phisihing in COS. Testing it from this site: https://openphish.com/ COS results are disappointing. As well as those of CIS. I uninstalled it again and returned to CAV. Hi guys, same problem here. I did a manual update to this version and ran into trouble. HIPS puts applications that are running on the list of blocked ones thanks to HIPS. Even if I declare them to be safe and trustworthy, after a few seconds the are listed as blocked ones once again. 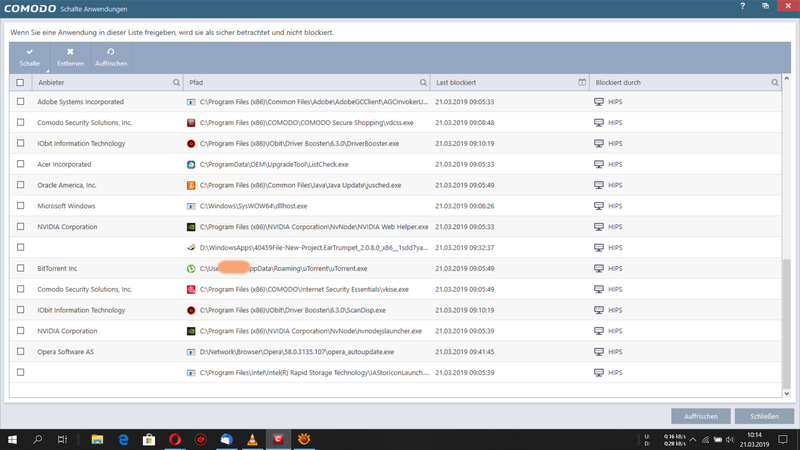 Can you show a screenshot of the HIPS logs showing what files are getting blocked? Sometimes when uninstalling a security program it may leave behind a driver or service. This driver or service may cause unexpected interactions with CIS. Could you please run clean up tools of security programs you had installed in the past to make all traces of them are removed? 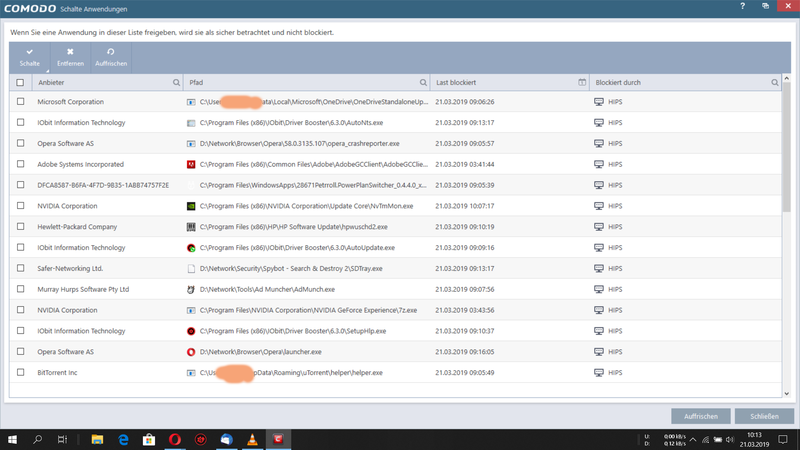 A list of such clean up tools can be found here: https://support.eset.com/kb146/?page=content&id=SOLN146 . Experienced users could use Autoruns and look for left over drivers or services. What you showed is not the HIPS event logs, the logs will show why they are being blocked by indicating the actions that are blocked by HIPS. In the meantime I was contacted via pn and sent the logs. Could you still post a screenshot of the HIPS Event Logs here? It will allow us to understand what is happening and comment when we think it is needed. It will also help other users to understand. I have reinstalled CIS (with the firewall) and it's all OK. I did the speed tests and the speed is optimal. Probably the site I used for speedtest was not good. Do you suggest someone reliable? I ran it from the Netherlands and it did a correct measure. When using speedtest services make sure to use a server nearby (low ping time). Sometimes providers provide a speedtest page. They often used a third party tool like f.e. from Ookla. But the best measurement is downloading a sizeable bin file of 100 Mb or 1Gb. And last but not least do not use your wifi connection when testing but a wire. I reinstalled CIS and the problem is gone. With the update of CIS a problem appeared with Acrobat Reader but it seems to be not related to CIS. A re-installation of Acrobat Reader solved that problem, too.